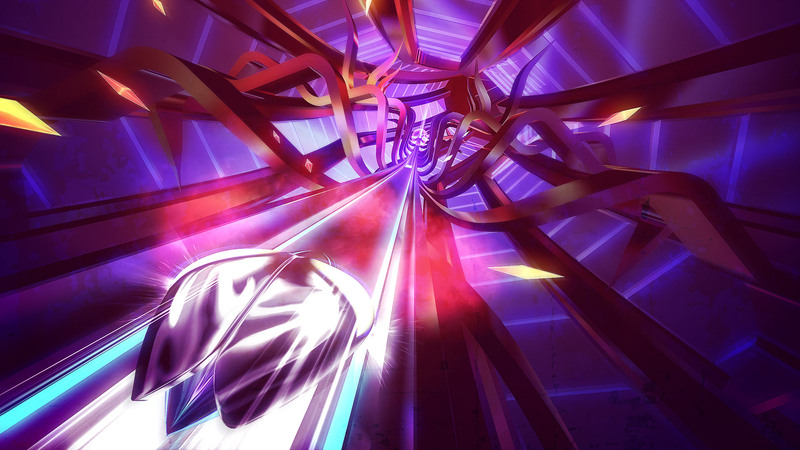 Thumper is a fast paced “rhythm violence” arcade game developed by DROOL for PlayStation VR and PS4. As a space-scarab-like creature you’ll rip down an infinite slide while jumping, drifting, and thumping obstacles. You’ll do battle with giant amorphous creatures, all while trying to topple your friends’ high scores. This rhythm game is much more about survival than song as you blaze your way to the perfect run. 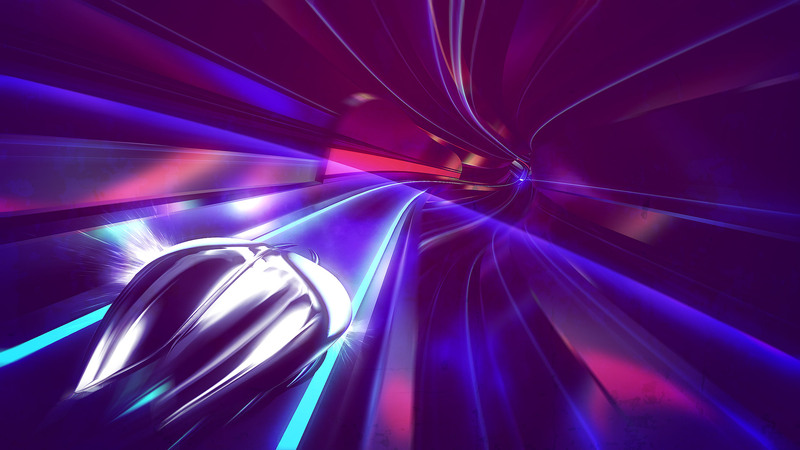 In Thumper you’ll quickly find yourself experiencing tunnel vision. The progressively pacey twitch gameplay demands all of your focus in order to survive each level. As an arcade rhythm style game, players will glide over barriers, drift into embankments, dodge track serpents, and blast through or over hurdles to survive the visually stunning gauntlet, all while enjoying an ambient electronic soundtrack that intertwines with the gameplay. Levels play somewhat like other rhythm games (ie: a linear track), except instead of seeing a “Poor!” pop-up as your punishment for being off-beat, in Thumper, you die. 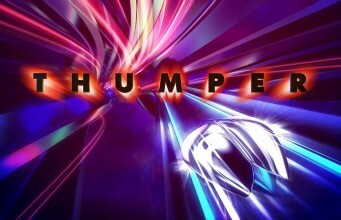 While most rhythm games give you distinct songs and beats against which to memorize and perfect your performance, Thumper’s ambient tracks prefer to throw more abstract musical obstacles at you that work more like a ‘call-and-response’ than a structured metronome abiding beat. This makes the rare moments when the game does throw a groove at you utterly satisfying. In a Super Mario style health system, the scarab can only take two hits before dying on the second hit, however there is hope for those not fleet of finger, as timely performances end with an opportunity to get your top layer back. And when you do, you’ll find a very satisfying ‘click’ as fresh shiny wings lock onto your scarab. Although this may seem to make the game too easy in the early stages, it becomes quite clear that you’ll need every bit of help to survive the later levels. When your shield comes off due to a missed beat the sense of danger spikes and you might find yourself whispering a prayer that you make it long enough to get your armor back; it’s exhilarating. As the space scarab you’ll find yourself flying at a giant evil head or some amorphous looking monster straight out of Star Fox; these beasts are bosses and mini bosses, and represent uniquely difficult moments in the game. 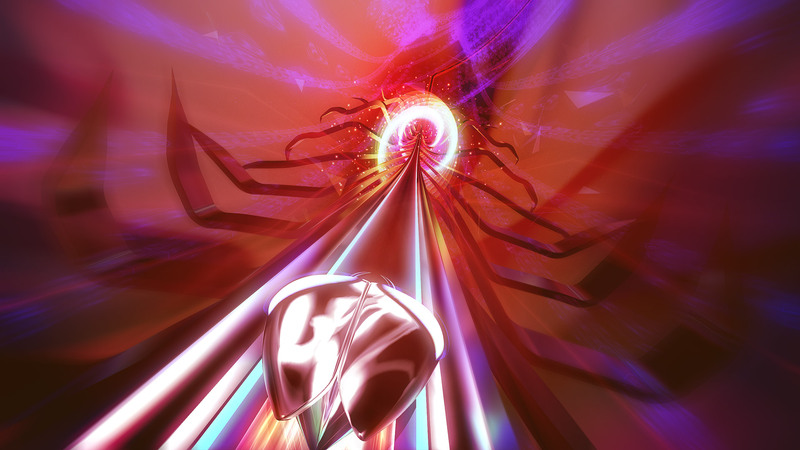 At the end of each level segment, Thumper players are graded on their performance, resulting in an overall grade for the level as a whole. Players also earn points by taking no damage, hitting turns perfectly, and successfully navigating obstacles while maintaining the beat. Grades range from perfect ‘S’ to poor ‘C’. Going by sheer points, no two runs are likely to be the same, and even those scoring in the S grade can compete for the very top place on the leaderboard among friends or the global community, giving a nice incentive for players to come back if they like the competition of defending their standing. Thumper is actually a fairly long game, with playtime varying greatly with skill. The game encourages play in sessions, with each level a sprint of intense visuals and reaction-challenging sequences to be tackled when you put on the headset, hopefully resulting in the relief of completion, or perhaps the determination to come back and try another time if you aren’t able to push through. It is especially worth picking up if you have a nice sound system with a ‘thumpy’ bass. 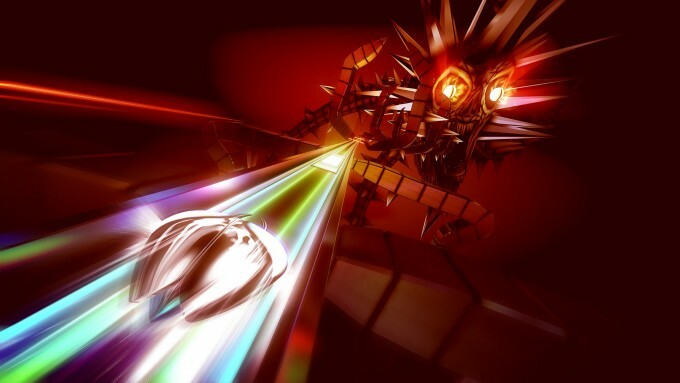 Thumper is quite challenging, but with enough practice, determined players will find themselves skillfully banking and juking their way to satisfaction. As you sail along the intensely colored scarab space highway, you’ll find yourself so focused on the gameplay that you won’t have much time to notice the awesomely trippy background animations. The game works perfectly well with or without the headset. Initially, this had me wondering why Thumper was even a VR game. From the perspective of immersion, you are really just fixed on a single point, and it doesn’t appear that PSVR is really necessary as there’s no need to look anywhere but straight ahead. My perspective changed the further into the game, as it is moderately helpful once you’re ‘in the zone’, to be locked in the world instead of focusing on just a screen. Playing without the PSVR is softer on the eyes, but the game’s visceral visuals, audio and, and sense of breakneck speed is heightened with it on. The sense of speed is so great that you might find yourself occasionally surprised that you’re able to keep up with the game. Thumper is among only a few PSVR titles we’ve seen running natively at 90 FPS. Disappointingly, beyond immersion, Thumper makes almost no real use of the VR mechanic as you have no reason to ever look away from the track at the screens center. You can look up a little bit to see what’s coming down the track at you, which is cool to see (and necessary to survive), but you can see just as much information without the headset on. It’s nice to have the option, but you probably wouldn’t be able to justify buying PlayStation VR just to go from Thumper’s standard mode to the VR mode. Thumper doesn’t appear to have any real story, but it doesn’t have time (or need) for one as a rhythm twitch based arcade title. Overall it is immersive with the gameplay conducting the majority of the players focus, but probably isn’t the best use of the VR’s broader capabilities. You might think that Thumper’s speed and winding track would make it a recipe for motion sickness in VR, but actually the segment of the track that’s immediately in front of you is kept static, which avoids the feeling of you actually rotating or moving down the track. Instead, it feels a lot like the track is coming at you. 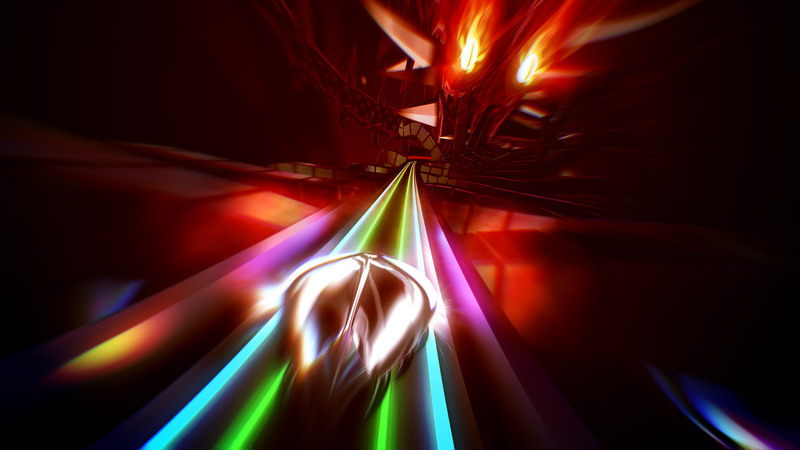 The pink-floyd color scheme may be harsh for those sensitive to flashing lights, but overall the game has dark coloration punctuated by neon colors signaling events which make it tolerable for a period. I wouldn’t recommend playing this game for more than two hours at a time, as beyond that it’s easy to get a headache. The game itself is rather intense from both a gameplay and visual standpoint, which lends it to potentially being a stressful experience, and perhaps not the game you want to play to relax. This is both what makes the game fun, but also encourages session-by-session play. For me the game’s visual intensity and pace could build up over lengthy sessions into headache which made me not want to carry on. Others I spoke with who played the game for more than an hour on-end didn’t have the same issue, so your milage may vary. The post ‘Thumper’ Review appeared first on Road to VR.